Previous sports: skating, swimming, triathlon, pentathlon. 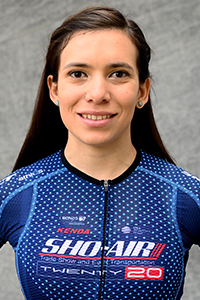 Sofia Arreola is a young successful rider from Monterrey, Mexico. Before becoming a cyclist Sofia did all different kinds of sports such as speed skating, sports shooting and swimming. She started riding when she was 14 years old and she became national champion one year after that. After winning 6 gold medals at the PanAm Championships and a 4th place at the Jr World Championships in Moscow, she was invited to the World Cycling Center in Switzerland for the 2009-2010 track season. Her first year as an elite rider wasn’t easy but she gained so much experience in the World Cups and took a silver medal at the senior PanAm Champs that is when she decided to focus on track cycling. She won 2 silver medals at the World Championships and became the first ever rider to win two medals at one championships for her country. Sofia is now a full time cyclist and student and she lives in Colorado Springs. The speed, the adrenaline and the freedom.